Our experience, proprietary contest software and engaging visual design multiply your fan base and convert fans into customers. Introducing Social Contests. The super easy way to run powerful Facebook campaigns, and get actionable data that turns fans into customers. WalkJogRun, a top running app for iPhone was looking for a way to build new awareness for their app on Facebook. 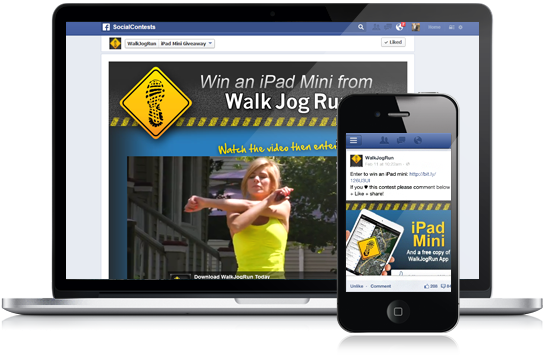 WalkJogRun turned to Social Contests to help them design and execute a successful Facebook campaign. 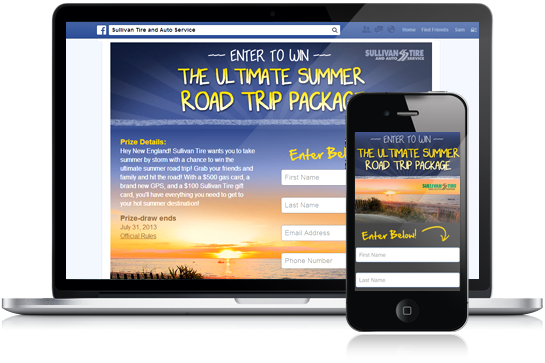 Run Engaging Facebook Contests that grow your fans, your email list, and your revenue. Social Contests offers a full service Facebook Application platform that includes everything you need to run a successful contest, sweepstakes, or promotions on your facebook page. It all starts with a great idea. Through our years of experience we’ve learned what works and what doesn't. We work closely with each client to design a campaign strategy that is guaranteed to succeed. Our talented graphic designers work with you to build a visually compelling campaign that fits your brand and creates an innovative user experience. We work with you to get the look and feel of your contest just right and we won’t stop until you’re satisfied. Our proprietary technology stack and high speed hosting infrastructure set us far above the competition. Your campaign will be ready to handle everything including mobile optimization, user acquisition, and viral sharing. Leveraging the power of Facebook advertising, email marketing, and other promotional channels we identify exactly how to ignite your campaign for maximum reach and campaign engagement. We advise our clients on best practices, assist with media buying, and help with all advertising creative needs. We don't just stop with a great looking campaign. Behind the scenes we're capturing tons of data to help measure results and optimize your campaign. Features include Data Capture, Fraud Prevention, Real-Time Reporting, Campaign Tracking, Geo-Targeting, and Winner Selection. Compelling campaign visuals & design, tailor-made to match your brand’s look and feel without the headache of a template. We’ll work with you to succeed your expectations and wow your fans. Our development team makes sure your campaign can do all that you want it to. Looking for tech features that the others can’t provide? Tell us and you’ve got it! And Results You Will Love! 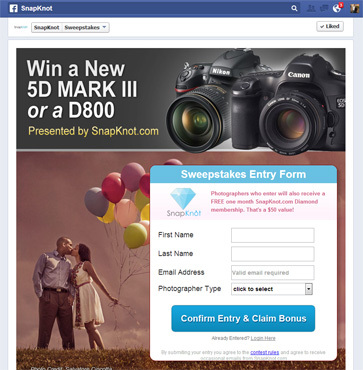 SnapKnot.com teamed up with Social Contests to create an exciting giveaway targeted towards their professional wedding photographer audience. 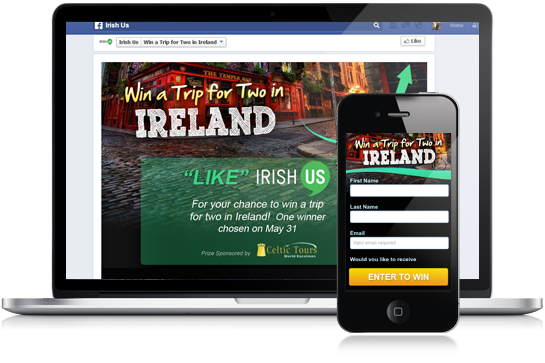 "The Facebook contest designed and developed for us has been very successful - in fact the results blew away our expectations"
Contact us for a FREE consultation, we promise we don't bite!